Let’s make things really simple. Run with me on this one – there are only two things in this world, Context and Content. 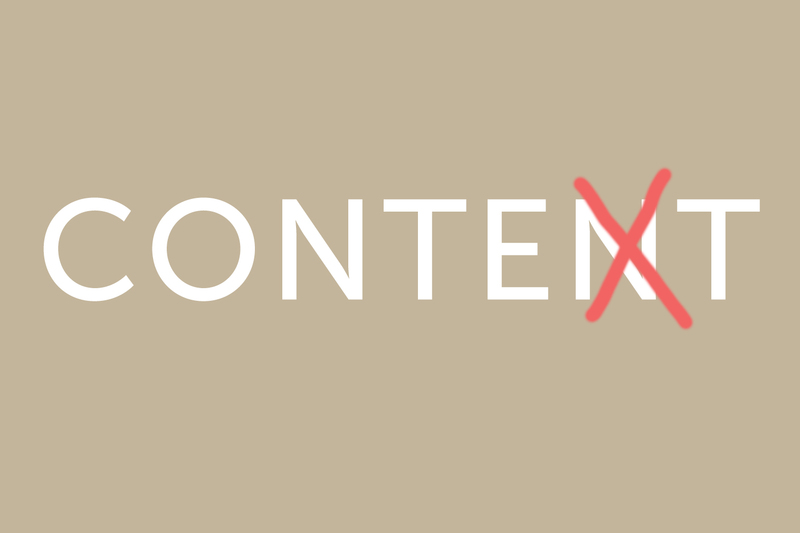 Context, the meaning we make of all of the above. …and we start to lose connection with the Context. As we lose connection to the Context we start to lose connection to the meaning, the Why we do what we do on a daily basis. And this gives us great access/opportunity. Quite often large shifts in groups of people in organisations can be achieved less by looking at the Content, (although that may be necessary) but more by redefining and reinvigorating the Context, the frame of reference within which people go about their work. When people have more meaning for what it is they do each day, (and this connects with their personal values and beliefs) they can then choose themselves to do what is the right thing because they are connected to the bigger picture. And that simplicity starts with a Why, because when people are very clear on the Why, the context or the bigger picture, they are better able to work out what is needed and how best to achieve it. And this is particularly important in Safety or any organisations where there is remote working or a distributed population – people who are working autonomously and may not be closely supervised. It is extremely important under these conditions that people have the simplicity of leadership – great clarity on the context, the Why, because they don’t always have someone to confer with (to remind them of the Why). They have to make decisions themselves to do the right thing on the spot (in isolation). And so quite often for any organisation, the great opportunity is to create that simplicity through great leadership – it is an opportunity to release the next level of performance. We have a choice as to where to intervene next, do we turn up the volume on the management side, i.e. more tools, systems, processes etc. or do we turn it up on the leadership side? But here’s the important point – the more we lead, the greater the clarity of our cause, our belief, our higher purpose, our Why, the less we have to manage. When we create the clarity of the Why we create a space into which people can step, and step up, which means that they can chose to relate differently to the content, what they do and who they do it for and relate to these things as ways to enable more of the Why. So, this is where WhyNot tends to focus to release extraordinary potential/performance through people in organisations. Because most organisations that have been around a bit have got management cracked – if they didn’t have this sorted the organisation simply wouldn’t exist anymore. So, the biggest potential we see is in the leadership/context space, getting reconnected at a very human level to why you do what it is you do and supporting/enabling people to see what it is they do as a full expression of that. Let me illustrate this by an example. We were asked to ‘train’ one Police Service’s 600 Supervisors and Sergeants in the Police Code of Ethics. This was a nationally defined program and all well thought through and valuable content, but of course existed for people initially as just more stuff to do. With our client, we took a different approach to simply training this group of people, we discovered and formulated the Service’s Why, by engaging all of the population in the process, led by the senior team and then introduced Ethics as a choice everyone could make to better fulfil on their Why. This group of people took on owning the Ethics as the Context from which they would do their work, rather than something they had to do. They then set up structures to discuss and learn what this meant for each individual and a sustainable and self-regulating process was established – ‘Police Ethics’ for people simple became who they are, and one way (a critical How) that enabled everyone to fulfil on their Why. In this way, for this group of people, Content had become Context. I simply want to tell you that I’m newbie to blogging and site-building and honestly liked your web-site. Very likely I’m want to bookmark your blog . You absolutely have perfect writings. Appreciate it for sharing your blog. Hiya, I am really glad I’ve found this information. Nowadays bloggers publish only about gossips and web and this is actually annoying. A good site with interesting content, this is what I need. Thanks for keeping this website, I will be visiting it. Do you do newsletters? Cant find it. Hello there. I discovered your website by way of Google even as looking for a comparable topic, your web site came up. It looks good. I’ve bookmarked it in my google bookmarks to come back then. I do consider all the ideas you’ve introduced on your post. They are really convincing and will definitely work. Nonetheless, the posts are very quick for starters. May you please lengthen them a little from subsequent time? Thank you for the post. My wife and i were really more than happy that Michael could do his web research with the precious recommendations he received using your blog. It’s not at all simplistic to just choose to be releasing thoughts many others have been making money from. Therefore we grasp we have got the blog owner to be grateful to for that. All of the illustrations you have made, the straightforward site navigation, the relationships you can make it possible to foster – it is everything wonderful, and it is assisting our son and us recognize that the content is awesome, and that’s rather important. Many thanks for everything! Wow, fantastic blog layout! How long have you ever been running a blog for? you made blogging look easy. The full look of your site is wonderful, as well as the content! Hiya, I am really glad I’ve found this information. Today bloggers publish just about gossip and web stuff and this is actually irritating. A good website with interesting content, that is what I need. Thank you for making this site, and I’ll be visiting again. Do you do newsletters by email? I have been surfing online greater than 3 hours nowadays, yet I never found any interesting article like yours. It is beautiful value enough for me. In my opinion, if all web owners and bloggers made good content as you did, the net will be a lot more helpful than ever before. Hiya, I’m really glad I’ve found this info. Today bloggers publish only about gossip and internet stuff and this is really irritating. A good website with interesting content, that is what I need. Thank you for making this website, and I will be visiting again. Do you do newsletters by email? Hey there. I discovered your blog via Google even as searching for a similar subject, your web site got here up. It appears good. I’ve bookmarked it in my google bookmarks to come back then. Hey there. I discovered your site by the use of Google even as searching for a comparable topic, your website came up. It seems great. I’ve bookmarked it in my google bookmarks to visit then. hello!,I really like your writing very much! percentage we communicate more approximately your post on AOL? I require an expert on this space to resolve my problem. May be that’s you! Having a look forward to look you. I want to show some appreciation to this writer for rescuing me from this particular instance. After researching through the internet and meeting solutions which are not beneficial, I was thinking my entire life was gone. Existing minus the solutions to the difficulties you have sorted out as a result of your main review is a crucial case, as well as the ones which could have adversely affected my career if I hadn’t noticed your website. Your own personal expertise and kindness in handling all the things was tremendous. I’m not sure what I would’ve done if I hadn’t encountered such a subject like this. I am able to at this point look forward to my future. Thanks so much for your reliable and results-oriented help. I will not think twice to endorse your blog to any person who needs care about this area. Thanks for some other magnificent post. Where else may just anyone get that kind of info in such a perfect method of writing? I’ve a presentation subsequent week, and I am at the search for such info. Hiya, I’m really glad I’ve found this information. Nowadays bloggers publish only about gossip and web stuff and this is actually irritating. A good blog with interesting content, that is what I need. Thanks for making this website, and I’ll be visiting again. Do you do newsletters by email? Hello there. I found your website by means of Google at the same time as looking for a related topic, your web site came up. It appears great. I have bookmarked it in my google bookmarks to come back then. Hiya, I am really glad I’ve found this information. Today bloggers publish only about gossip and internet stuff and this is actually frustrating. A good website with interesting content, this is what I need. Thanks for making this site, and I’ll be visiting again. Do you do newsletters by email?